The little crowd presses close to the man with the list. He calls out the first name and a frisson of eagerness, of expectation and even hope roils from one to another, women wearing layers of mismatched castoffs, men in tattered caps and suits worn long past respectability, children in anything that fits. They reach up in desperation and yearning. The long journey is at an end. Some of the quilts stitched in Perry Hall by the women of St. Michael Lutheran Church have reached their destination, 7,000 miles away, in the Muslim country of Azerbaijan. 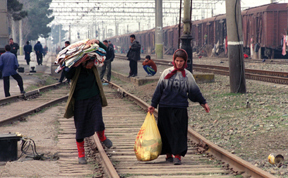 Shipped from Baltimore along with quilts from other U.S. churches, trucked to a United Nations warehouse in the capital of Baku, they have been driven to refugee settlements: in Saatli, where many of the 50,000 refugees who live in drafty railroad boxcars are encamped, and to Vagazin, where a few hundred others live in snake-infested underground holes, and to Agjabedi, where 400 more live in an abandoned hostel with sporadic electricity and no running water. The refugees clutch piles of three and four quilts as if they will bring deliverance. Someone has thought of them, has sent them something to help, a bit of warmth for the spirit as well as the flesh. Left: Each family uses three boxcars: one as a kitchen; one as the foyer; and one as a bedroom/living room. But then the attention delivered with the quilts is over. The empty truck pulls away. And once again these are a forgotten people, a virtual city of forgotten people, 570,000 of them scattered around the country. Quilts cannot offer a way out of desperation. They cannot suggest peace with Armenia, or promise a return to the homes and lives abandoned eight years ago when the war began. They do not bring the prospect of jobs, or decent clothing for the children, or any kind of future at all. "I don't need aid", says Valida Gasimova, a retired teacher in Agjabedi. "I need my own land back." The women gather around her, telling of sick husbands and daughters, of the shame of surviving on handouts when they could work if only they had jobs, how their teenagers suffer bitterly for lack of decent clothes, how their small children go without toys. But they are a sturdy people, and they are as ashamed of complaining as they are of their circumstances. "We are refugees," says Gulchohra Taghiyeva, a 45-year-old former school librarian, "and we are very grateful for everything you send us. "We have stopped complaining," she says. "Just don't pay any attention to that." They are country women, favoring long dresses or skirts and brightly colored kerchiefs on their heads. Taghiyeva wears what has been given to her despite the incongruity - a tracksuit jacket over a leopard-print dress. She insists that any visitors here must come to her home for tea, and if they refuse she will be mortified forever. 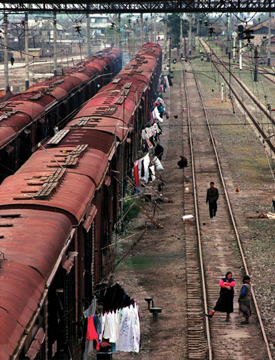 Above: One day in 1993, the freight trains stopped running through the Azerbaijan town of Saatli because their destinations had been captured by Armenia in the war over the Nagorno-Karabakh region. Soon, displaced people on the run filled up the boxcars that once held animals and grain. Somehow, they live their lives here, even cooking the large flat rounds of bread on outdoor fires built between the rails. Children like Elman Mammadov (left) have no toys and little to do. He sits as bread is being prepared by (from left) Elmira Guliyeva, Filyar Mammadguliyeva and Kamala Mammadguliyeva. 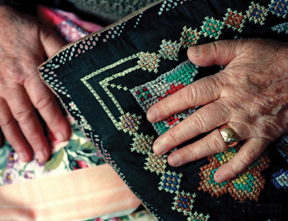 Left: The talented hands of 70-year-old Afarin Abdullayeva have produced rugs and quilts and needlepoint and embroidery. On this day, they clutch a gift (left), a patchwork quilt from Maryland, and some of her own work (right). She leads her new American friends to the five-story hostel, where the hallways are long and very dark, and children emerge from the apartments like rabbits bounding out of a cramped hutch. Her family of six lives in two rooms. Often, they go for three days without water, which they haul from a tap outside the building when it's running. 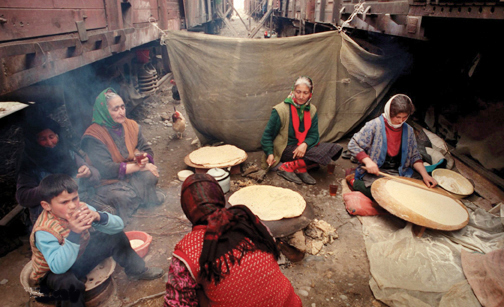 Taghiyeva walks to a nearby river to wash clothes; she cooks on a hotplate and bakes bread in an outdoor oven. A group of families built an outhouse, their only convenience. Though Taghiyeva's two rooms are damp and dark, treasures lie inside. At the expense of medicine for her husband and clothes for herself, she has sewn a dowry for her 22-year-old daughter: more than a dozen thick quilts. "I'm proudest of these," she says, lovingly stroking two in red velveteen and another in green. "I sew with my daughters. It's our tradition. All the things we were preparing for my son, we left behind. We were building him a house, so he could marry. That's gone. But I have a dowry for my daughter." Eight more dowry quilts are airing outside, waving on a clothesline like sunny flags of defiance, testament to Gulchohra Taghiyeva's refusal to surrender to circumstances. These rural people cherish their bedding. When they fled their homes, it was their quilts they gathered up as they ran. 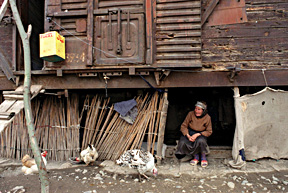 Right: A refugee woman sits under an abandoned boxcar, the only place the refugees in Saatli can now call home. 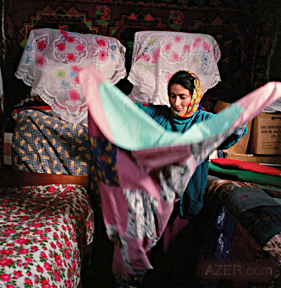 In the countryside of Azerbaijan, a woman's reputation could stand or fall on the plumpness of her pillows and the elegance of her quilts, and her handwork provided a rich vein of conversation for neighbors and relatives to mine. At night, pallets were put out on the living room floor for sleeping. Mornings, they were folded up with the colorful quilts, stacked in the living room under a crown of pillows and covered with a veil of white lace, a still life ready for any neighbor's appraising gaze. Left: Once Filyar Mammadguliyeva, 32, (left) and Kamala Mammadguliyeva, 25, had little stone houses surrounded by trees. War destroyed it all. Now they walk along railroad ties instead of garden paths. They are carrying quilts, made by Lutheran women in America and distributed here by the United Nations High Commissioner for Refugees. Though the women all pride themselves on their own beautifully handmade quilts, the arrival of the gifts connects them, for a moment, to the wider world, which otherwise ignores them and their desperate desire to return home. The wool in the pallets and quilts and the down in the pillows came from the sheep and geese the women tended, and a fat pillow was evidence of her talent and hard work. They have clung to their quilts as if even one small thread from their pasts will bind them together, protect them and preserve the promise of their return home. We love beautiful quilts and pillows," Taghiyeva says. Kind hands in far-off Maryland have sent quilts here. Capable hands made idle and desperate have received them. But the hands here remain outstretched, awaiting something more than hope.